The stoner ferment of which is the genesis of BISON B.C. left a strong influence in the first track of the new album of the Canadian quartet. We can hear the admiration to BLACK SABBATH with pre-exposed psychedelic elements. Not letting out the psychedelic doom metal fiber the band continues this adventure with heavy guitar sound and rhythm diversification. It seems that the boys carefully lead us to the moment when they demonstrate their music expression. Three compositions follow in which there are lots of all components of sludge metal. Hysteric vocals reproduce pain. Hard riffs are pouring down a drone padding while melting gently stoner melodies. The guitars express with no doubt the techniques of Tony Iommy and in their development they achieve decisions which remind of CATHEDRAL. But eclectics of the sludge metal weave the diverse components in a unique mixture. This is a bacchanalia of the neurosis in a music form. The combination of psychedelic tradition and contemporary contra point of the narcotic disease in the fast „Clozapine Dream“ crowns the fierce efforts of the contemporary musician! After that BISON B.C. as they carefully introduced to us the opening of the album, let us out from their loaded with information music with a final song. It is more conventual’s composition and could be compared with some songs of TROUBLE. It is not by sudden that Metal Blade believed in BISON B.C. yet with the appearance of their first EP! 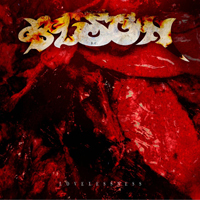 ’Lovelessness’ demonstrates the maturing of the band with no changes of their style. Their new songs are more completed as compositions and they could be characterized with braver experiments. And quite in a Canadian manner the nucleus of their expressive music is ’packed’ in carefully chosen and presented songs.